Baloch leaders held an interactive session at University College London to discuss important issues concerning Balochistan. More events will follow. 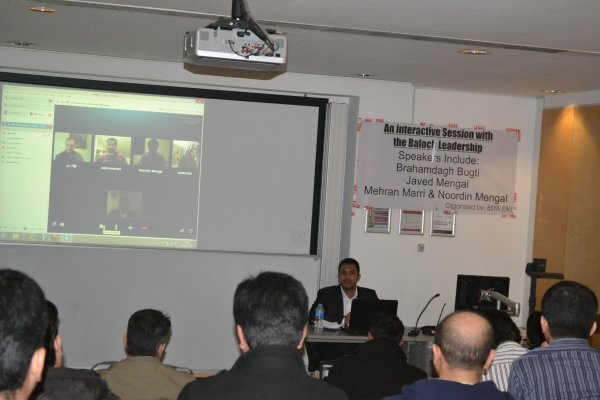 An interactive session with the Baloch leadership took place at the University College London on 10th February, 2013. Prominent Baloch leaders Brahumdagh Bugti, Javed Mengal, Mehran Marri and Noordin Mengal took part in the discussion and expressed their views on different aspects concerning the Baloch national struggle. The event was organized by the Baloch Students and Youth Association (UK). The program was hosted by Qambar Baloch, the president of the Baloch Students and Youth Association UK. The session constituted of two parts, in the first part the speakers in their opening remarks shared their valuable views on different aspects of the Baloch national struggle along the international and regional political developments and their impact on Baloch national struggle, and in the second part; the question and answer session took place. In the initial quarter of the session, Qambar Baloch gave an overview on the organizations aims and objectives and the necessities of the Baloch students in UK as a result of which the organization laid its foundation. He urged that the prime objective of the organization was to assist the students in their personal, social, educational matters and utilize their abilities and talents to fulfill their national ambitions in the UK. He said, BSYA is an educational, social and HR organization and its members will co-work with other organizations to preserve the Baloch culture and rights and create awareness on the HR violations taking place in Balochistan among the journalists and other international humanitarian and student organizations. In regards to Baloch politics, he added our aim is to develop a trend among the Baloch parties, activists and leaders to promote positive discussions, respect each other and curb the misunderstandings between them to help them accurately analyze the strengths and weaknesses of Baloch struggle. He urged that the Baloch Diaspora beholds a huge responsibility on its shoulders to heal the wounds of the nation and contribute their efforts in the Baloch national struggle. He said that BSYA intends to promote a greater sense of unity among the different sections of the Baloch national movement and today's educational program is a part of that process. The session commenced when Brahumdagh Bugti was asked about the major achievement and losses in the Baloch struggle in the past one decade. He expressed his views that Pakistan has been committing heinous crimes against the Baloch nation since the past one decade. He mentioned that the Pakistani army and its intelligence agencies have implemented a new strategy to deal with the growing discontent in Balochistan. That strategy is to kidnap Baloch activists in broad day light, torture them and dump their mutilated bodies on the roadside to install fear in the hearts of the masses in order to prevent them to struggle for the national cause. He added that the Pakistani establishment has out-sourced this activity to different proxy organizations. He said that the army has established death squads which are operating with a different nomenclature in various parts of Balochistan. They have played their role in the abduction and killings of hundreds of students, doctors, engineers, and teachers, members of the civil society, tribal elders and political activists. He said that many Baloch political leaders have been picked up by these proxy death squads and their mutilated and tortured dead bodies are found on road sides on a regular basis. Despite these hardships, the Baloch struggle is progressing, we are getting more organized and the Baloch nation is bravely facing the state barbarism and are not willing to give up their struggle, concluded Brahumdagh Bugti. He stressed that it was imperative for the Baloch to ensure national unity. The second speaker of the event, Noordin Mengal said that the upsurge in attention by the media and human rights organizations on the situation in Balochistan has helped in internationalizing the issue and considered it as an achievement of the past decade. He regretted the financial assistance provided to Pakistan by world powers, which was abused by the Pakistani military against the secular Baloch. He added that the human rights violations in Balochistan is going unabated despite the reports and pressure from the various HR organization on Pakistan. He said that Baloch being an empowered nation can be a better and natural ally to the west than Pakistan. Pakistan has the long history of deception to the west whilst the Baloch are secular and peace loving people. Supporting the Baloch can benefit the west to contain terrorism and religuous extremism and help bring peace, stability and security in the region. He added that an independent Baloch state can safeguard the strategic interests of the west in this part of the world. He said that the Pakistan army and intelligence agencies are promoting radical elements and fundamentalism which is not only a threat to the Baloch, but to all of humanity. He concluded that the targetted killings of the educated class and youth of Baloch society who have the ability to spread awareness, at the hands of the Pakistan military as one of the major losses of Baloch movement in the recent years. He urged the Baloch nation to stand united as it is the key to success, ensure respect for others and beware of conspiracies to divide them. Mehran Marri, when asked about the increasing sectarian violence, religous extremism and fundamentalist violence in Balochistan, said that the Pakistani army and intelligence agencies are behind these initiatives and its purpose is to undermine the Baloch nationalist cause and to signal a negative message to the international community by linking the Baloch struggle with the religious extremists to neutralize any foreign pressure to stop Pakistan from continuing its slow motion genocide against the Baloch populace. But it has failed to keep this duplicity from the international community as the west is well aware of its double standards, who on one hand is taking billions of dollars to fight the war on terror while on the other hand is exploiting the western interests in Afghanistan and providing safe haven to terrorists within its borders. He said that the Baloch people must struggle collectively and be aware of efforts to divide them. Javed Mengal in his speech, claimed the loss of towering figures of Baloch national struggle such as Nawab Akbar Khan Bugti and Nawabzada Balach Marri, the indiscriminate killings of thousands of Baloch and the abduction and summary executions of the backbone of Baloch society as one of major losses the Baloch nation had faced in the last one decade. When asked about the Chinese interest in Balochistan he said that China is taking advantage of the current situation of Balochistan. The relation between Pakistan and China is not unknown to the world and Pakistan uses this to blackmail the West and counter neigbouring India. When asked if Balochistan would survive after independence as Pakistan claims it cannot, he said that Pakistan itself is economically unstable and weak and itself relies on Balochistan's wealth. He said that it is in fact Pakistan which cannot sustain itself without Balochistan. He said that Balochistan has vast reserves of natural resources and can prosper better than many prosperous countries in the region. He regarded the expansion of Baloch nationalistic aspirations to almost every Baloch house as an achievement and that the draconian tactics of the Pakistani state have not been successful in containing the Baloch aspirations. All the participants formed consensus on unity to be the need of the hour and forming united platform. They urged the Baloch political activists to respect each other and stressed to form and understanding among them which could bring the Baloch together. They equally denounced the elements who knowingly and unknowingly are creating rifts, divisions and misunderstandings among the Baloch political parties and leadership. They also said that they are united and that there are no misunderstandings or division among them and they are collectively working on unity by taking Baloch political parties and leaders into confidence and vowed to contribute in the formation of a united front. The host concluded the session by appealing to all the Baloch leaders and activists to form an understanding and unite on a single platform and assured to organize such interactive and educational events in the future.